Wellness Coaching is an emerging profession that has roots in applied behavioral science and adult development, and more recently has embraced positive psychology. Behavioral scientists have shown that one-on-one coaching is among the most effective approaches to helping people make and sustain improvements in their lives. What Are Health & Wellness Coaches? "Coaching is a one-on-one conversation between a coach and a client that guides and motivates the client to make behavioral health & wellness changes. A coach acts as a champion, personal resource, and accountability partner, thus inspiring the client to achieve more than they could alone. Coaches strategize with clients in order to discover the most productive and sustainable ways to enhance the client’s overall wellness in the areas of fitness, nutrition, stress, and time management." "The culminating experience of the Wellness Coaching Internship pulls together all of the knowledge of the minor and gives the intern the opportunity to practice wellness coaching with real-life clients and reflect on this experience." "I had the great privilege of interacting with several undergraduate wellness coaching students at a Wellcoaches workshop held at the University of Louisville in 2011; I was thrilled with the engagement and caliber of these students! I am impressed with not only the Interdisciplinary Wellness Coaching Minor curriculum, but also with the expert team of interdisciplinary faculty (Health & Sport Science, Social Work, Psychology, Human Resource Development, and Public Health Advocacy) involved with the Wellness Coaching Minor, and the corporate partnerships U of L is creating to increase job placement for its wellness coaching graduates. "Students are engaged in improving their critical thinking skills and translating science into coaching practices. Embracing the application of science in helping coaching clients improve their mindsets is a unique aspect of the program, one that strongly links the university's academic mission with the Wellcoaches mission and contribution. The University of Louisville is at the cutting edge in teaching wellness coaching at the undergraduate level." 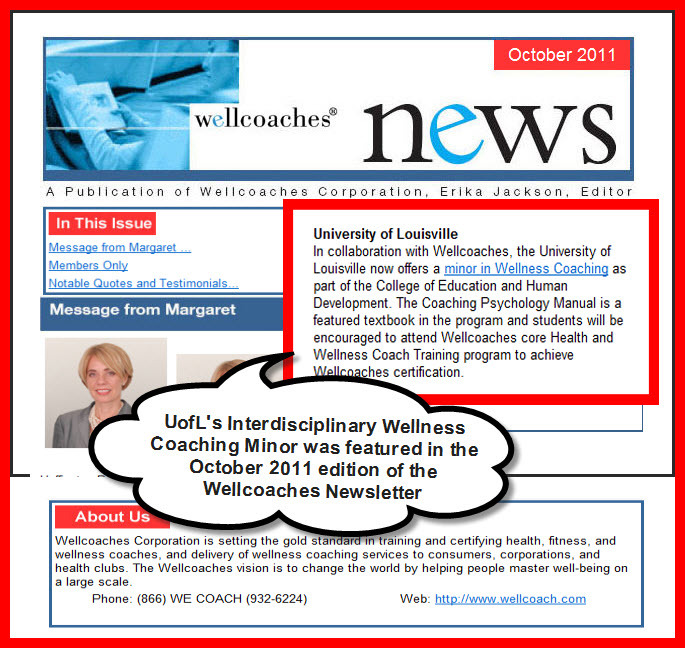 UofL's Interdisciplinary Wellness Coaching Minor was featured in the October, 2011 edition of the Wellcoaches Newsletter.